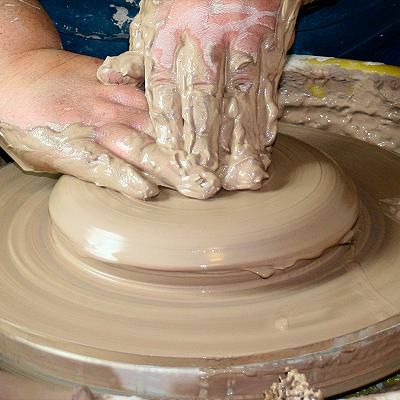 How you open the clay on the potter's wheel will affect the rest of the throwing process. If rushed or done with poor hand placement, the pot may be doomed to be off-center. During opening and creating the floor of the pot, the wheel should be rotating at either full or three-quarter speed. Keep the clay's surface well lubricated. It can be advantageous to keep a sponge tucked into your right palm so you can release water onto the clay as needed, without having to cup water and bring it across from your bucket. Your movements should be firm and smooth during opening and throughout the throwing process. It can help to keep your movements at a fairly slow pace, especially when first learning. Quick pushes and releases on the clay can result in the clay being knocked off-center. Opening the clay must be done so the opening is centered. To find the center of the clay, lay the fingers of your right hand across the top of the centered clay so that they go over the mid-point. Rest the tips of your left-hand fingers on the backs of your right-hand fingers. Positioning your hands in this way will ensure that the clay will open on-center. Once your hands are positioned, it is time to open the pot to the desired depth as you throw on the potter's wheel. Gently push downward with your left hand on the backs of your right-hand fingers, keeping your right-hand fingers straight. Because your fingers were across the center point, the clay will automatically move away from the pressure so that the opening is centered as well. Be sure to keep the clay well lubricated during opening. Continue the gentle downward pressure on your right-hand fingers until you think there is about a half inch of clay between the bottom of the opening and the bat's surface. Stop the wheel. Use your potter's needle to check the floor's depth. It should be between a half and a quarter inch unless you are planning to trim out a foot when the pot is leather hard. r Once you have established the depth of the pot, it is time to create the floor. The wheel should be at about three-quarter speed and the clay kept well lubricated. As you pull toward you, curve your fingers so that the clay bulges slightly upward above your fingertips. This will help you get an even wall thickness as you begin to throw the wall. After the floor is completed, use a sponge and remove any excess liquid. Now run your fingers back and forth over the floor, lightly pressing down. Do not move any clay; this step's purpose is to compress the clay. This strengthens it and reduces the possibility of cracking. Now that the floor has been created, place your right hand on the outside and your left hand on the inside of your pot-to-be. The wheel should be slowed to between a quarter and half speed, and the clay kept well lubricated. Your hands should be exactly opposite from each other so that they are together with the clay moving between them. Gently push the clay from both sides so that the walls straighten upwards and become even in thickness from top to bottom. If you are throwing a pot that narrows at the top, you may want to straighten the walls so that they form a truncated cone instead of a vertical cylinder. This will make it easier to control the shape as you throw. Use a sponge to remove all excess liquid from the floor of the pot. Your pot is now open and ready for the first throw. How Long Does It Take to Make a Pot? What Is Terracotta and How Do You Use It? What is Wheel Thrown Pottery?